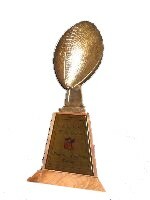 This cast bronze regulation size football sits on top of a custom solid walnut base, and stands an impressive 22" tall. Dimensions: 22" Tall X 12" Wide X 12" Deep Weight 19 lbs. Due to the size of this trophy, it will ship in 2 pieces and will require some simple assembly. The assembly procedure is to connect 1 bolt that will require a 7/16 inch deep well socket, and a extension for your ratchet. Total time - less than 3 minutes.